Rift valleys are not caused by erosion but are created by tectonic activity. Grabens are another name for these valleys. Today geologists use the term graben primarily to describe valleys on the continents. The valleys form when continental crust is pulling apart allowing the land to drop down between parallel faults. These valleys also form when oceanic plates are moving apart forming a divergent boundary. Iceland is in a unique area on our planet where geologists study the global mid-ocean ridges and visitors can walk through a valley on the Mid-Atlantic Ridge. The valleys form a boundary between the Eurasian Plate and the North American Plate. The Mid-Atlantic Ridge runs down the center of the Atlantic Ocean. It rises above sea level on Iceland because the island sits above a hot spot in addition to the sitting atop the Mid-Atlantic Ridge. 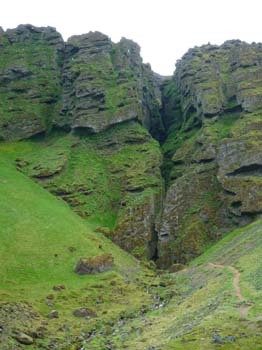 Visitors can walk along the Mid-Atlantic Ridge on the island. Tectonic forces create rift valleys on the continents when a crustal plate is pulled from two different directions and the crust thins. Parallel faults are created as the crusts is pulled apart and a central section drops downward forming a graben. As the tectonic forces continue to pull the crust apart the rift valley increases in size until it becomes a basin. The basin continues to drop downward as the rift widens. Lake Baikal and Lake Tanganyika are two lakes that were once rift valleys that became so deep they formed a lake. Lake Baikal is the deepest lake on Earth. It also contains the greatest volume of fresh water on our planet. Lake Tanganyika is the second largest lake and contains the second largest volume of fresh water on Earth. Both of these lakes were created by active rifting of a continent and the rifting continues at this time. Lake Baikal is located in Siberia on the Baikal Rift Zone. Lake Tanganyika is located on the westernmost arm of the East African Rift Zone. If these two rift zones continue they will break apart the crustal plates they are located on and will create new plates. Sea water will flood the rift valleys and they will eventually become seas like the Red Sea. Oceanic rift zones occur deep in ocean basins where two oceanic plates are separating. These rift zones were not discovered until the middle of the last century. The discovery of rift zones led to the understanding of how continental drift could occur on our planet that had been proposed by Alfred Wegener earlier in the 20th Century. The discovery of rift zones also led to the Theory of Plate Tectonics. The Theory of Plate Tectonics explains why 75% of active and dormant volcanoes are along the Pacific Ring of Fire that surrounds the Pacific Ocean. It also explains why 90% of the world’s earthquakes occur around the Pacific Ocean and 81% of the largest earthquakes occur here. The earthquakes and volcanoes are the result of small and large tectonic plates separating and being subducted around the Pacific Ocean. The global mid-ocean ridges are found in all the oceans on Earth. The center of these mid-ocean ridges are rift valleys that separate lie between the two separating plates. As the plates move apart magma from the upper mantle flows out onto the ocean floor in the valleys creating the newest crust on the planet. The valleys are at the summit of a bulge in the floor of the ocean that gradually drops down as it moves away from the ridges when two plates are separating.